We bid goodbye to 2013 tomorrow. Tomorrow! I wish I could extend it another month. Just 30 days. But nobody's listening to me. So I sit for hours making collages of things I'll take along with me to 2014, and things I've already let go of. 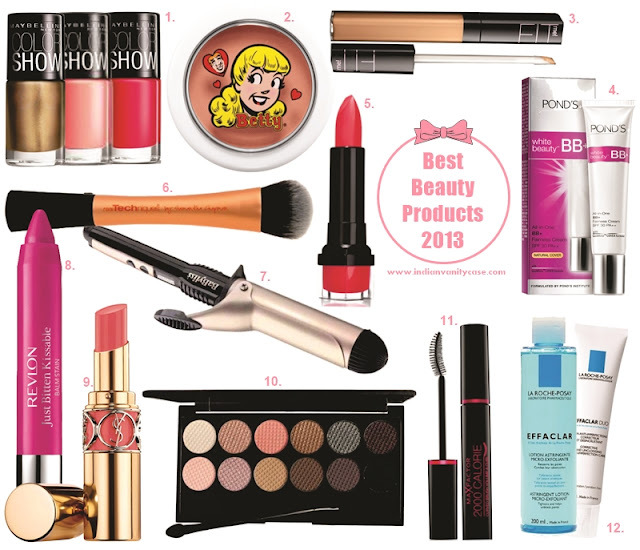 It was hard to pick out only some products, so I did my best to exclude a lot of the products from previous monthly favorites & disappointing beauty products posts. Let's say this list is very sorted out. 1. Maybelline Color Show India ~ Exclusively the Indian versions, because of both the price and quality factors. They are different from UK versions. All the Indian ones are better than one UK shade I'm wearing right now. Swatches here & here. 3. Maybelline Fit Me Concealer ~ Probably the best drugstore undereye concealer. I regret not trying it sooner. Now I want to try the powder too! 6. Real Techniques Expert Face Brush ~ I practically lived on this brush this year because it blends everything in a jiffy, it's easy to clean and dries quickly. 8. Revlon Just Bitten Kissable Balm Stain Sweetheart ~ Most-used lip crayon. Swatches here. 11. Max Factor 2000 Calorie Curved Brush Mascara ~ My most favorite mascara this year. I strayed from it, and realized it's unbeatable. Length, Volume, No clumps. I gotta repurchase. Shown here. 12. La Roche-Posay Effaclar Astringent/Clarifying Lotion & Effaclar Duo ~ Life-changing twosome . Holy Grail. Pimply skin saviors. Blemish-free skin. 1. Revlon PhotoReady BB Cream ~ Too OILY! No coverage. Layering just means more oil. Don't know what else to say. 2. The Body Shop Wild Rose Hand Cream ~ L'Occitane Rose Hand Cream copycat. A bad- smelling one at that. Like cheap agarbatti (incense). Not moisturizing enough + I have little flaky bumps on the back of my hands that appeared right around the time I started using it. 3. Maybelline The Eraser Concealer ~ This was a shock, coz I read rave reviews. I find it too greasy. It may work better on very dry skin, but I must say the coverage also fell short, so I'm not so sure. I'd suggest Fit Me Concealer up there to anyone. 4. Fade Out Nourishing Night Cream ~ I've told you before that it smells like socks! I would have easily overlooked that if it did anything special. It also made my skin break out. I think it's one product I really really regret buying this year coz it's not cheap. 5. Bourjois Happy Light Foundation ~ Turns orange when blended, oxidizes, whatever you wanna call it. I wonder how it'll work on legs, hmm. Swatched here. 6. Sleek True Colour Lipstick (Heartbreaker) ~ Worst.Lipstick.Ever. Patchy matte. Looks like peely glue on lips. 7. Tresemme Split Remedy Masque ~ My hair ends felt like they expanded. Difficult to detangle. 8. Clearasil Rapid Action Vanishing Treatment Cream ~ Claims to make pimples reduce in size/redness in 4 hours. I watched the clock, I depended on it one time. 10 hours later, I was the only one who still cared. 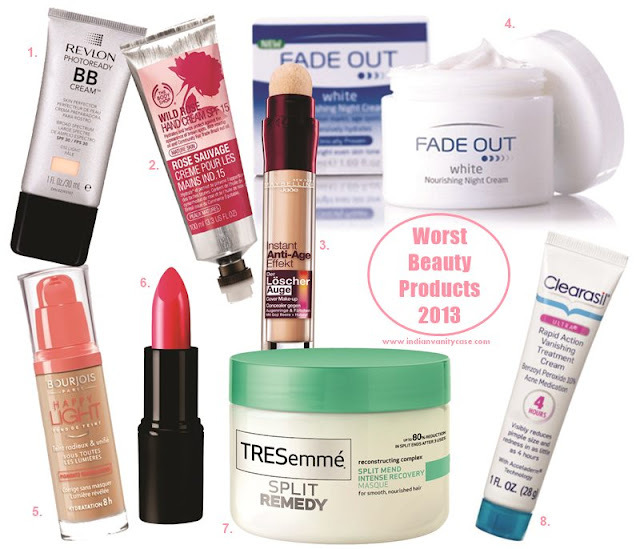 *More Worst & Disappointing Beauty Products here. What are your Best & Worst Beauty Products this year? Ah thanks for sharing. I love Maybelline FIT. The colors match so well. You're so right that we need another 30 days in 2013, but I'm sure 2014 will be a fantastic year. I love Sweetheart. It is such a gorgeous colour. And I on the other hand can't live without my La Roche-Posay Effaclar AI - Targeted Breakout Corrector, just the best stuff EVER. I was using that one too, and it did help quite a lot! Oww...really?! That's too bad! I find it works better with the Clarifying Lotion, so maybe you could try it with a toner. I love the Pond's BB Cream, sad that its not available here in Thimphu, Bhutan :(. Now i have to try the FIT me concealer! Great post .. i literally wait for your posts.